Recent years have seen the humble sandwich receive a gourmet makeover in Melbourne. Hungry masses are now demanding more from this lunch box staple, with old faithfuls like the ham and cheese two-step being replaced with bigger, bolder, and more beefed-up menu items, such as the ever-popular American import, the Reuben. Traditionally, the Reuben is comprised of corned beef, sauerkraut, Swiss cheese and Russian dressing on rye bread, lightly toasted and served with a pickle on the side. When done right, this colossal sandwich becomes not only the best thing since sliced bread, but it takes said sliced bread and turns it into something absolutely extraordinary. While the Reuben's heritage is rife with controversy – both New York and Nebraska lay claim to the gargantuan sandwich – we're just glad it made its way to Melbourne, and in celebration of that feat, here are eight of Melbourne's best Reuben sandwiches. Get involved. The first question that presents itself when a quality Reuben arrives at your table is: how on earth do you tackle this meat mountain?? At Dead Man Espresso, where the sandwich in question is piled extremely high with all the good bits, this quandary is best solved by cutting that sucker in half. With pastrami substituted for corned beef and ample lashings of house made sauerkraut, this Reuben sandwich is a shining example of all that is wonderful about the Melbourne café scene. Food envy guaranteed not to ensue. The Reuben served up by this slip of a venue on the Gertrude end of Brunswick Street is well worth making the trip across town for; nay, across the state for. While by no means visually intimidating given it lacks the height generally associated with a Reuben, this sandwich packs some unbelievable flavour, offering up all the traditional trimmings (with sautéed cabbage replacing the sauerkraut). It's a messy eat, but worth every drip. Plus, if you're currently pinching pennies, Tuesdays are a blessing at Martha Ray's, as these delicious sandwiches are only $10. All. Day. Long. Perhaps the most picture-perfect Reuben in Melbourne, Carre Street Deli's example looks just like those you'd expect to see coming out of a true New York deli, albeit with a few ingredient changes. This stunning sandwich, which has been featured in The Age Good Food Guide and Epicure, offers house made pastrami, gruyere cheese, mustard and sauerkraut on rye with a side of pickles. It's a testament to just how amazing this sandwich is that when Fantine Wu took over ownership two years ago, the Reuben remained firmly on the menu, and the recipe kept untouched. 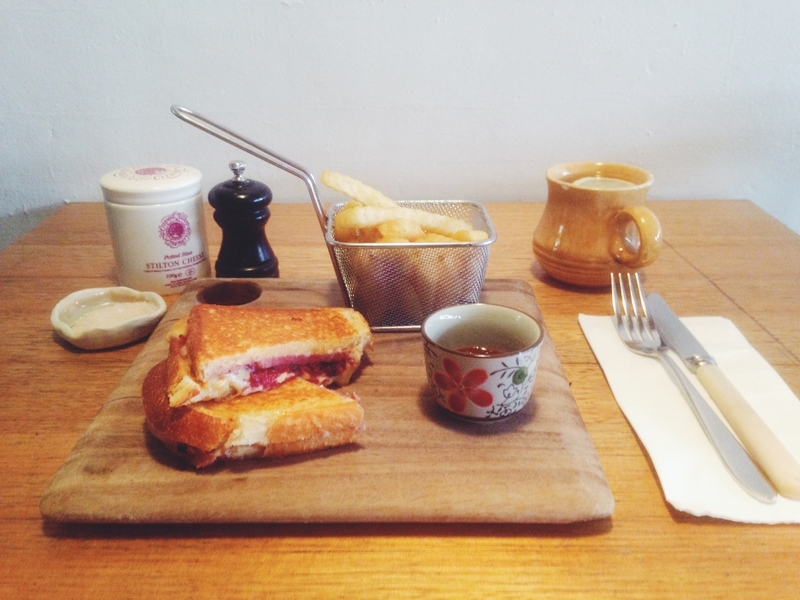 A truly Melbourne interpretation, Pope Joan dish up the Reuben in toastie form. Using corn bread instead of rye, smoked mozzarella instead of Swiss, and pickled cabbage instead of sauerkraut, Pope Joan successfully do what no one else dares try: create a Reuben that is equally at home on the lunch and the breakfast menu. So, enjoy this faultless and flavoursome Reuben with either some mulled wine, a Bloody Mary, or your morning coffee. Seriously, Pope Joan's coffee machine is churning out some of the city's best. Pair this with one of Melbourne's best Reuben sandwiches and you'll be a very happy camper. Perhaps the longest serving Reuben in Melbourne, this beauty has been adorning North Cafeteria's menu for seven years. A twist on the classic however, this version does away with the sandwich structure and becomes a Reuben on toast. Now, Reuben traditionalists may baulk at the idea of this corned beef hybrid, but one bite and we promise you'll be a convert. Besides, when you're presented with corned beef open grilled on rye with Swiss cheese, dill cucumber mayo and sauerkraut, what's not to love? Suffice it to say that Gramercy Bistro owner, Adam Faigen, is a fan of the Reuben. Before introducing the sandwich to his Prahran café's menu two years ago, he was dishing it up at his two previous venues, namely – and here's a plot twist for you – Pound and Carre Street Deli. Oh yes, gentle reader, that is the very same Elsternwick café we've already visited on this Reuben roundup. Faigen truly is the Reuben King of Melbourne, with his expertise shining through in Gramercy's sensational version. Their take on the classic features house made pastrami, Swiss cheese, sauerkraut and mustard on a rye bagel, served with the trademark pickle and a side of fries. Another of Melbourne's best Reubens can be found in leafy Camberwell. The Reuben dished up by Prospect Espresso takes the sandwich to new heights – literally. Stacked high with all the traditional toppings, PLUS beef brisket, PLUS thick cut light rye, this sandwich is a mission in consumption. But trust us, it's worth the effort. The only Reuben to team up corned beef with beef brisket, this version proves that the only thing better than the original is a Melbourne interpretation. If you're of the assumption that a ready-made sandwich cannot possibly compete with a made-to-order version, you haven't been to Giddiup. 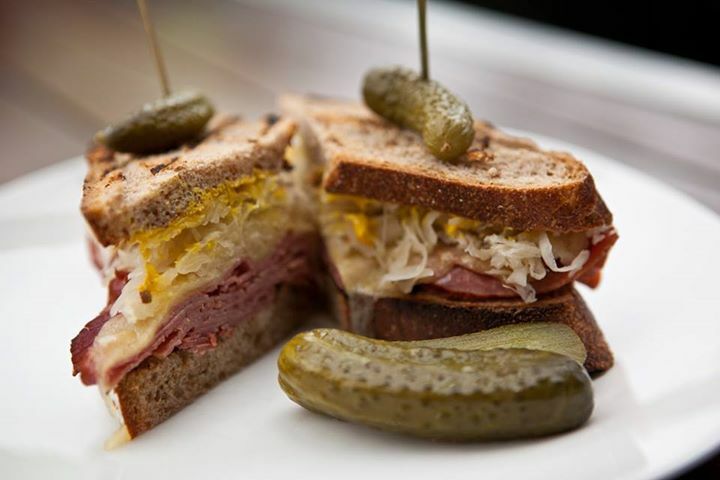 This Reuben consists of corned beef, spinach, cheese, pickle and sauerkraut on seedy bread, and is toasted upon order. While breaking from tradition a bit with its ingredients, this sandwich still packs a mean punch. Plus, waiting time between ordering and eating is drastically reduced, which is always a bonus. So there you have it. Eight of the best Reuben sandwiches in Melbourne. Enjoy!